All GLM replacement lower housings for the V6 and V8 OMC Stringer 800 sterndrives have the new heavy duty #22666 sets. This new set has fewer, larger, stronger teeth. The pinion has 12 teeth and the forward and reverse have 22 teeth. The original OEM set has 14 teeth on the pinion and 26 teeth on the forward and reverse gears. During the machining process an additional pass is made over each tooth for a finer surface. This makes the operation especially quiet. These durable gears are capable of operating with up to 300hp. All GLM lower housings have the large 1-1/4 inch diameter prop shafts with a reverse thrust washer installed between the shaft and reverse gear. *Many 1978 - 1981 OMC sterndrives have had the hydraulic shift lower housing replaced with the 1982 - 1985 mechanical shift lower housing. 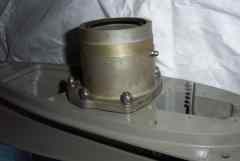 Stern-drives with the original hydraulic shift lower housing do not have an E.S.A. (electronic shift assist) box or over-stroke switches on the shift converter. 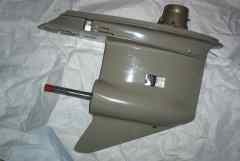 1978 - 1981 sterndrives that have been converted to the mechanical shift lower housing should have the E.S.A. and over-stroke switches installed to stop clutch dog wear. 4.3 Liter V6 Year 1985 200-230 HP. 5.0 Liter V8 years 1981 - 1985 260 HP. 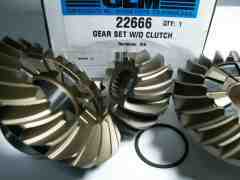 Click here for used OMC parts or rebuilt upper/lower gearcases in stock. 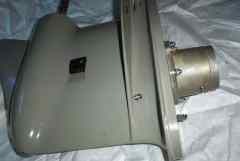 Used lower unit gearcases come with 1 year warranty. 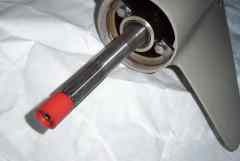 Note shift cable and shifter must be sent in or purchased, again we have used or new aftermarket cables.